Collins scored a team-high 21 points (8-12 FG, 0-2 3Pt, 5-6 FT) while adding five rebounds, a steal and a block in 35 minutes during Saturday's 129-120 loss to the Hornets. The second-year big continues to have a breakout campaign, and Collins is averaging nearly 20-and-10 a night as one of the centerpieces of a rebuilding Hawks roster. In fact, the 21-year-old has been maybe a little too good -- he and Trae Young have led Atlanta to 18 wins, giving the club only the fifth-worst record in the NBA and potentially giving them a tougher path to a top pick in the draft lottery. Playing with only seven players Desi Rodriguez (198-F-96, college: Seton Hall) and Agua Caliente Clippers (16-18) fell to Sioux Falls Skyforce (23-14) on Friday night with a 135-120 Both teams were evenly matched in the first quarter, but Rodriguez's (25 points, six rebounds) 10 first-quarter points kept the Clippers close on the heels of the Force. The Clippers return home on Sunday for a single-game homestand falling to Grand Valley Vipers, 130-97 on Sunday. The Clippers only played with seven players and Rodriguez had seven points and five rebounds. The team will have the next week off for the All-Star break. TURKEY -Frank Elegar (208-C-86, college: Drexel) followed him with 17 points on 8-of-10 shooting and eight rebounds to lead Tofas to a 95-74 home win over Afyon Belediyespor on Day 18 of Turkish League. Tofas improved to 12-5 as fourth-placed while Afyon stayed near the bottom with a 4-12 record. UNITED KINGDOM-Justin Gray (198-F-95, college: Texas Tech) and Bristol Flyers (8-9) dropped another British Basketball League game, this time to Glasgow Rocks, 99-82, Sunday afternoon. The Flyers trailed at 11 points at the half, and rallied back in the third to knock down five straight threes to take the lead, but a 15-3 response from the hosts was too much. Gray is returning from an ankle injury had only four points and three rebounds in limited action. 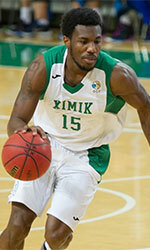 UKRAINE -- Deon Edwin (190-G-92, college: Kent St., agency: Interperformances) lost his temper but Khimik (16-6) routed Odessa, 92-78 in the SuperLeague on Friday. Edwin left the court for two technical fouls in the second, but the loss of one of the leaders did not affect the team's play, as Khimik kept their opponent at a respectful distance. Edwin finished with 6 points, 2 rebounds and 3 assists. United Arab Emirates -- Walter Hodge (183-PG-86, college: Florida) did not play in the bronze medal game and it showed as Homenetmen could not hang with Mighty Sports-Philippines 91-76, to wrap up the 30th Dubai International Basketball Championship campaign. Hodge scored 42 points in their first encounter sat out in street clothes. The Mighty Sports has NBA Legend Lamar Odom on their roster. The defending Lebanon champs (9-2) will return to the LBL action on March 3rd. MEXICO - Jamaal Samuel (206-F-93, college: La-Monroe) and Tampico Hurricanes (6-30) played and evenly matched Correcaminos but couldn't stave off a late run falling 121-113 in the National Professional Basketball League (LNBP). Samuel finished with 23 and also recovered 14 boards with 5 assists. VENEZUELA - Georgio Milligan (187-PG-90, college: Franklin & Marshall) and Guaros de Lara advanced to the semifinals of the DirecTV Americas League after going undefeated in the first round. Guaros knocked off Arecbio (Puerto Rico), 84-81 on Friday and Ponce Lions on Saturday, 83-79. They completed the sweep with a 92-85 win over Libertadores de Queretaro (Mexico). Guaros de Lara is basically Venezuela's senior men's national team. 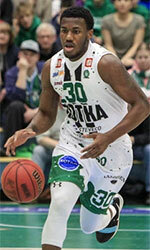 TUNISIA -- Jason Perry-Murray (206-PF-94, college: Grambling St.) and CA Bizertin are still searching for the rare win. Bizertin were blown out by Club Africain, 86-50, in Play Out action of the Tunisia Basketball League on Friday. Sophomore forward Nicolas Claxton (211-SF-99) and the University of Georgia men's basketball (10-13, 1-8)team lost to the Ole Miss Rebels 80-64 on Saturday afternoon in Stegeman Coliseum. Claxton had eight points, six rebounds and two blocks. "I think we started out the game and it was 18-8, you know we were up. Everyone was knocking down shots, we were in rhythm. And I think those turnovers, the turnovers hurt us but just us not having that fight, and just coming back and trying to hit them in. That is just really disheartening for us to come out like that and not play hard. So we just need to get it right." "I think that is just maturity. Not letting one mistake affects another one. Not letting one mistake affect another play. So, if we get a turnover, we just have to have short-term memory, you can't dwell on that. So, I would say that is something we really need to work on." "I can't even tell you. We just need to come together as a team. I can't just tell you that. We really need to come together as a team, and just have a meeting. Just talk about it because at this point in the season we don't have anything to lose, we might as well just go out there and give it our heart. I feel like we should just come together as a team, and give it our all every game." Freshman power forward Ahsan Asadullah (203-C) had 12 points and pulled down 5 rebounds as the Lipscomb men's basketball team held off an upset-minded Jacksonville squad and extended its winning streak to 11 games with an 86-77 victory Saturday in Allen Arena. The win improved the Bisons to 20-4 overall and 11-0 in league play. It marks the third-straight 20-win season for the first time in the program's Division I history. It was also the 19th consecutive win for the Bisons against an ASUN opponent. 'I love watching him develop. Gonna be a great one in a long history of great Bison big men,' said Daniel Dennison. Romani Hansen (203-F) had 12 points, five rebounds, three assists as Savannah State beat Coppin State 71-62 on Saturday night. Collins Joseph (183-PG) had eight rebounds and nine points for the home team for Savannah State (8-15, 5-4 Mid-Eastern Conference). The Tigers leveled the season series against the Eagles with the win. Coppin State defeated Savannah State 73-67 on Jan. 5. Jahmiah Simmons (193-F-98) was in a boot during North Texas loss to Western Kentucky, 62-59, and won't play any time soon after injuring his ankle on Thursday. Senior guard Shaun Willett (193-F) recorded his NCAA-leading 21st double-double as the No. 11/10 Queens University of Charlotte men's basketball team (22-3, 14-1 SAC) topped Tusculum University (10-12, 6-8 SAC), 97-88, on Saturday at the Levine Center. Willett scored 25 points and grabbed 15 rebounds. Queens lead by 14 points and halftime and never led by less than eight points in the second half. Freshman forward Shaquan Jules (201-F) had 11 points in the No. 4 University of South Carolina Aiken men's basketball team's 92-75 victory over North Georgia Saturday afternoon. Jules nearly brought down the house with a monster slam at the 4:54 mark. The Pacers extended the lead to 13 and held a 46-36 lead at the break. USC Aiken embarked on a 13-2 spurt over the first 3:39 and never looked back. During the run, Brock and Evans connected on lay-ups. Evans followed with a three-point shot before Brock canned back-to-back baskets from deep for a commanding 59-38 lead. The Pacers are now 20-2 overall and 14-2 in the PBC. The Nighthawks are now 8-13 overall and 3-12 in league play. Junior forward Kwame McBean (203-F) had 12 points for the University of Arkansas at Monticello (14-8, 10-6 GAC) in a 68-64 victory over Henderson State University (14-8, 9-7) in Monticello. Following the Weevils run, the Reddies went on a 7-0 run from 2:28 to 1:27 in the second period. This cut the Weevils lead to 2 points making it 66-64. Weevils will hold on to win 68-64. Tiger men's basketball earned their third-straight win Saturday afternoon with a nine-point victory over Life University at the Powell Athletic Center. For most of the 40 minutes of the game, both teams were pretty loose with the ball as the Running Eagles and the Tigers had more turnovers than assists in the game. That was the first time for CU that their final turnovers as a team were higher than their final team assists. Campbellsville (19-6) was led offensively by Stephaun Adams (185-G-96) who came up a point short of a career-high with 29 points to lead all scorers in the game. Adams was 5-of-10 from three-point land while adding seven rebounds, four steals, and four assists. Leonardo Castillo (193-F) scored a dozen as Motlow State dropped a tough contest to Walters State, 82-66, Saturday afternoon. However, Motlow State (11-3) remains in first place in the Tennessee Community College Athletic Association basketball race in front of Walters State. Motlow has four league tilts to play and are 15-9 overall. NEW JERSEY -- Camille Fleming tallied10 points to lead Elizabeth (10-12) to a 56-46 road win over Benedictine in Elizabeth. ILLINOIS --Maroons top Wooden Shoes. Khailieo Terry also contributed with 14 points, hitting seven of seven shots after intermission, helping carry Champaign Central (13-10) boys' basketball to a 51-36 win at Teutopolis on Saturday night to cap the Wooden Shoes' own one-day shootout. CALIFORNIA - Ramel Lloyd Jr. and Calabasas fell in the opening round of the CIF Southern Section Division 1 playoffs to Crespi Celts' 75-63. Lloyd will now gear up for the number one AAU team, The Compton Magic. Bryce Zephir and Santa Monica (21-7) defeated Capistrano Valley 73-29 and will take on Valencia (22-6) on Tuesday evening in the second round of the Boys Division 2 AA. NORTH CAROLINA -- Christ School in the championship game after the Greenies knocked off N'fari Benjamin and Rabun Gap 65-55 in the other semifinals game. Despite the loss, Rabun Gap made the NCISAA 4A playoff and will travel to Wesleyan Christian on Tuesday for a 6pm regional play in game. Malcolm Farrington (191-G-99) finished with 24 points, (21 in the second half), 4 assists and three steals Oldsmar Christian at SIAA Crossover at West Oaks. DME received an automatic bid to the Grind Session World Championships. Jahsean Corbett and Poinciana fell to Osceola, 57-54 in the Orange Belt Conference boys basketball championship. The game drew a packed crowd. Osceola (18-6) scored its seventh straight win and snapped a seven-game winning streak for Poinciana (15-8). Ponciana a 4th seed hosts Tavares today, Monday for the right to play #1 seed Bishop on Tuesday in Class 6A 13th district. JoVaughn Douglas and #1 Sanford Seminole (19-4) is on a 13-game win streak, and will face the winner of Lake/Winter Springs on Wednesday in the Class 9A district 2 semifinals. Shukiou Sprauve and the 4th seed Boone HS (12-11) takes on University on Tuesday in class 9A District 4. The winner advances to play #1 seed Timber Creek on Wednesday. J-Quan Ferrol, Jemal Davis, Kimani McIntosh, Ky'Ode Walters, Jemoi Davis and Okeechobee (18-4) open the Boys District 13-7A playoffs on Wednesday versus Heritage. If the Brahmas win, they would advance to Friday's semifinal versus the Eau Gallie/Bayisde winner for a shot at Saturday's finale. OHIO - Matthew Lee, the son of Alfred 'Butch' Lee, scored 51 points to lead Dohn Prep over Don Bosco, 125-120, in overtime. Lee, 19, still does not know his university destiny. However, he said that he has some institutions interested in his services. "My father got 50 points breaking the record in the Five-Star camp and that was his career high in points. My short-term goals are to continue my studies and my university-level basketball career in the United States," he said.